Not to be confused with animation. Animotion is an American synthpop band from Los Angeles, California, best known for the songs "Obsession", "Let Him Go", "I Engineer", and "Room to Move". Formed in 1983 from the remnants of a retro science-fiction band called Red Zone, they signed a record deal with Mercury Records in 1984 and made four albums. Animotion originally had five members, four of whom (lead singer Astrid Plane, keyboardist Paul Antonelli, bassist Charles Ottavio (not the original bassist of Red Zone), and drummer David "Frenchy" O'Brien) had originally been members of the band Red Zone. After the demise of that band, the four aforementioned members set about creating a new group with lead singer/guitarist Bill Wadhams; who would co-front the new band with Plane. Shortly after the formation of Animotion around this nucleus, lead guitarist Don Kirkpatrick was brought on board, completing the band's most well-known line-up. They released their self-titled debut album in 1984. That year, a single from this album, "Obsession", written by hit songwriter Holly Knight and noted British singer/actor Michael Des Barres (who originally cut the song themselves as "Knight and Des Barres" for the 1983 movie A Night in Heaven), became a worldwide success and the band's first US Billboard Hot 100 Top Ten single. The follow-up single from this album, "Let Him Go", also cracked the US Top 40 after being remixed in order to sound more like its predecessor. Following the departures of Antonelli and O'Brien, keyboardist Greg Smith, who had played on the band's debut album, and drummer Jim Blair became official members of the band prior to the recording of the follow-up album, Strange Behavior (1986). While several singles were released from this album, its success in the US paled in comparison to the debut album, whereas the band became very famous in Germany, Austria, Switzerland and South Africa, thanks to the LP's single "I Engineer", another Holly Knight composition which was co-written with Bernie Taupin and Mike Chapman. "I Engineer" reached the Top 20 (and sometimes the Top 5) in those countries. During 1986 and 1987, Animotion toured extensively, appearing alongside such performers as Phil Collins, Depeche Mode, Eurythmics, Genesis, Howard Jones, INXS, and Simply Red. In the midst of recording their third album, Animotion went through personnel changes; as all three of the remaining founding members (Ottavio, Plane, and Wadhams) departed at this time, along with Blair. The split was not amicable; Ottavio and Plane (who by this point were a couple, and later married) were fired from the band at the behest of the management; and Wadhams' departure was the culmination of a refusal of the record label to allow him to continue to write songs for the band (on their first album he had served as principal songwriter and, along with Kirkpatrick and Smith, had performed the same role on the second), a condition which he felt uncomfortable with. Actress/dancer/singer Cynthia Rhodes, known for her performance as the character "Penny Johnson" in the 1987 film Dirty Dancing, replaced Plane as female lead singer, and former solo artist/Device member Paul Engemann replaced Wadhams as the male lead for Animotion's second self-titled album, informally known as "Room to Move" (due to the success of this song) to distinguish it from their first LP. Incidentally, Engemann's former band, Device had also included Holly Knight (co-writer of "Obsession"). By the time of this third album's release, as only Kirkpatrick and Smith remained officially in the "band" along with Rhodes and Engemann; much of the recording of the album was done by other session musicians. 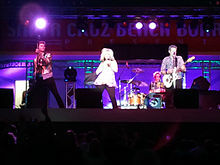 The single "Room to Move", a remake of a 1988 song by the group Climie Fisher, became a radio hit in April 1989, and their second Top 10 hit in the US, aided by its inclusion in the movie My Stepmother is an Alien. However, the album itself did not crack the top 100 on the charts, and Animotion broke up afterwards. Several of the original members reunited on February 8, 2001, in response to a request from Alex Hart and 94.7 NRK Radio Station in Portland, Oregon, performing for a sold-out crowd. Plane, Wadhams, Kirkpatrick, and Smith have continued to perform as Animotion since this time; with drummer Kevin Rankin joining them in 2002, and Bill's son Chris Wadhams joining as bass player in 2011. Don Kirkpatrick also plays in Rod Stewart's band. When he is unavailable, Portland, Oregon guitarist Kevin Hahn deputizes in the position. They have performed many shows with A Flock of Seagulls, Wang Chung, Berlin and the Motels in recent years. In the summer of 2005, Ottavio made a guest appearance alongside Plane and Wadhams who appeared as Animotion in the American version of the TV show Hit Me Baby One More Time, performing their hit "Obsession" and a cover of Dirty Vegas' "Days Go By". In the mid-2010s, the band - featuring core members Plane, Wadhams, Kirkpatrick, and Smith - recorded a new album, Raise, which was released in 2016 in the UK and a year later (as Raise Your Expectations) in the U.S. In 2009, Animotion was thrust into pop culture again as it was featured on VH-1's Top 100 One Hit Wonders of the 80s (in spite of the fact that Animotion are technically not one-hit wonders, as their second single "Let Him Go" made it into the top 40 in 1985, and "Room to Move" cracked the top ten in 1989, albeit with an almost entirely different line-up). Animotion came in at No. 12 with the hit "Obsession". Both Astrid Plane and Bill Wadhams were interviewed and featured. "Obsession" was the opening theme of the World Wrestling Federation's Saturday Night's Main Event from 1985 to 1988. It was also featured in the video game Grand Theft Auto: Vice City. "Obsession" was the opening theme for the speciality TV show FashionTelevision from 1985 to 2012. Animotion performed a cover of "Dancing in the Street" which featured in the 1985 film Girls Just Want to Have Fun. UK based specialist reissue label Cherry Red Records re-released deluxe editions of both the Animotion (1985) and Strange Behavior (1986) albums via its Cherry Pop imprint on August 17, 2009 (UK) and a week later in the US (according to Amazon.com). Extensive sleeve notes are by long-time fan Steve Thorpe; some visual archive material for the booklets was supplied by Charles Kennedy of Invisible Hands Music. The audio was remastered by Tim Turan in Oxford UK. The CDs each include several bonus tracks including 7" remixes and 12" remixes gathered from various singles released between 1984 and 1986 in Europe and the United States. 39 — — — — 41 — — 78 — "Holding You"
84 — — — — 27 — — — — "Staring Down The Demons"
53 — — — — — — — — — "The Way Into Your Heart"
^ "Allmusic bio". All Media Guide. Retrieved 2010-03-13. ^ History of the band Sideshow, which briefly included Frenchy O'Brien Archived 2011-10-05 at the Wayback Machine Retrieved 9-11-2011. ^ Animotion- Raise (UK title) @Discogs.com Retrieved 4-7-2017. ^ Los Angeles Times - Obituary of David O'Brien Retrieved 24 February 2019. ^ "Animotion Album & Song Chart History - Billboard 200". Billboard. Archived from the original on 15 September 2010. Retrieved September 16, 2010. ^ "Die Offizielle Schweizer Hitparade und Music Community". hitparade.ch. Retrieved September 18, 2010. ^ Animotion - The Language of Attraction @Discogs.com Retrieved 11-21-2015. ^ "Animotion Album & Song Chart History - Hot 100". Billboard. Archived from the original on 15 September 2010. Retrieved September 16, 2010. ^ "Animotion Album & Song Chart History - Dance/Club Songs". Billboard. Archived from the original on 15 September 2010. Retrieved September 16, 2010. ^ "Results - RPM - Library and Archives Canada - Top Singles". RPM. Retrieved September 16, 2010. ^ "austriancharts.at - Austria Top 40". austriancharts.at. Retrieved September 16, 2010. ^ "Die ganze Musik im Internet: Charts - German Singles". Hung Medien. Retrieved July 27, 2011. ^ "charts.org.nz - New Zealand charts portal". charts.org.nz. Retrieved September 16, 2010. ^ "Die Offizielle Schweizer Hitparade und Music Community". hitparade.ch. Retrieved September 16, 2010. ^ "Chart Stats - Animotion". chartstats.com. Retrieved September 16, 2010. ^ "Gold & Platinum Search - Music Canada - Animotion". Music Canada. Archived from the original on May 24, 2012. Retrieved July 27, 2011. This page was last edited on 19 April 2019, at 15:29 (UTC).